One in 70 children are admitted to paediatric intensive care (PIC) at some time during childhood. Most paediatric junior doctors will rotate through PIC, and will be involved in organising acute intensive care for critically ill children. The range of children and their illnesses going through PIC is vast, making it a hugely diverse specialty. A critically ill child will end up there regardless of their underlying disease, and as a result consultants in PIC must betrue generalists and need to acquire knowledge and skills in all areas of paediatrics, as well as acquiring significant knowledge of anaesthesia and surgery.From setting up the ventilator, to managing low cardiac output, Paediatric Intensive Care gives practical and realistic advice for children's doctors and nurses in intensive care. Information is presented in easily-accessible '5 minute chunks' to enable you to quickly get the answers you need, with extensive cross-referencing ensuring that different aspects of a particular clinical problem are fully covered. With detailed answers to specific problems and expert guidance on how tomanage the complex issues faced in PIC, this handbook is an indispensible guide for all those who provide care to sick children. 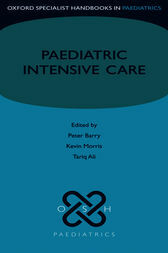 This very condensed but detailed handbook describes in its 43 chapters the anatomy, pathophysiology and treatment of conditions necessitating intensive medical care in neonates, infants and children... As the editors write this book is not just for intensivists, but should help also paediatric clinicians. Peter Barry has published over 60 papers and review articles in the fields of paediatric intensive care, inhalational drug delivery and high altitude medicine. He is currently a consultant in paediatric intensive care, University Hospitals of Leicester NHS Trust, and an honorary senior lecturer at the Department of Child Health, University of Leicester.Kevin Morris is a consultant in paediatric intensive care at Birmingham Children's Hospital and an honorary clinical senior lecturer at the University of Birmingham. He trained in adult medicine before completing his training in paediatrics in Newcastle upon Tyne and Birmingham. Further studies in PICU were conducted in Toronto, Canada and Melbourne, Australia before taking up his current post in 1997. He has a particular research interest in traumatic brain injury (TBI) in children.Tariq Ali began his training at St Barts and Homerton Hospitals in London before completing his specialist training at University College Hospital and Great Ormond Street Hospital for Sick Children in London. He has worked abroad as a visiting consultant at the Baragwanath hospital in Soweto, Johannesburg, South Africa and has worked briefly for Medicin Sans Frontieres during the conflict in Rwanda. He is a fellow of the Royal College of Anaesthetists and the Royal College of Paediatrics andChild Health. He has been a consultant in paediatric intensive care and anaesthesia at the John Radcliffe Hospital, Oxford since 1999.